In the past, several members have waited until the first show to pay their annual dues. Please notice that a new policy is in effect. SCAPE will not accept any payment of dues at the ingathering because all entries for the show must be done online prior to April 15 (see "Entry Procedure" below). Go to http://s-c-a-p-e.org. At top of page, click on “Join.” You may pay online with PayPal or credit card or you may send a check to SCAPE. Renewal fees are now $60 (the grace period ended March 31). Starting Monday, April 1, go to http://www.s-c-a-p-e.org/artwork-entry-bacara-show. Fill out an entry form for each painting. Limit of 6 entries. Final deadline for entering is Monday, 4/15 at midnight. Entry fees will be collected at ingathering. $10 per painting or $25 for 3 paintings. Paintings entered online will be delivered to Bacara Friday, April 19, from 9:00 - 11:00 am. The Botanic Garden staff and SCAPE’s team have been putting together the final pieces for the GARDEN’s Invitation Only Reception to be held Friday evening the 14th, from 4-6, and a handful of artist volunteers will be signing up at in-gathering to help with sales and artist information for that specific event. We’re lucky to have Nancy and Bill Hull doing the nice setup for appetizers and Myla Kato working on the wine donation. And extra fortunate that John Iwerks accepted to jury the show, while Natalie also obtained Chris Judge to play acoustic guitar. For the PUBLIC ALL-DAY SATURDAY SHOW, from 9am-6pm, both SCAPE and the BOTANIC GARDEN staff already started their PR with SCAPE’s postcard/invitation beautifully put together by Cheryl Fontana to be distributed soon, and the GARDEN’s monthly Calendar and other posts have been going out to local media for the Saturday PUBLIC SHOW. Natalie has her people lined up (EXHIBIT NEWS above) with Filiberto alongside while Jerry Martin and I have been working with the Garden on opportunities to paint the beautiful natives and California friendly plants on the GARDEN grounds and elsewhere. 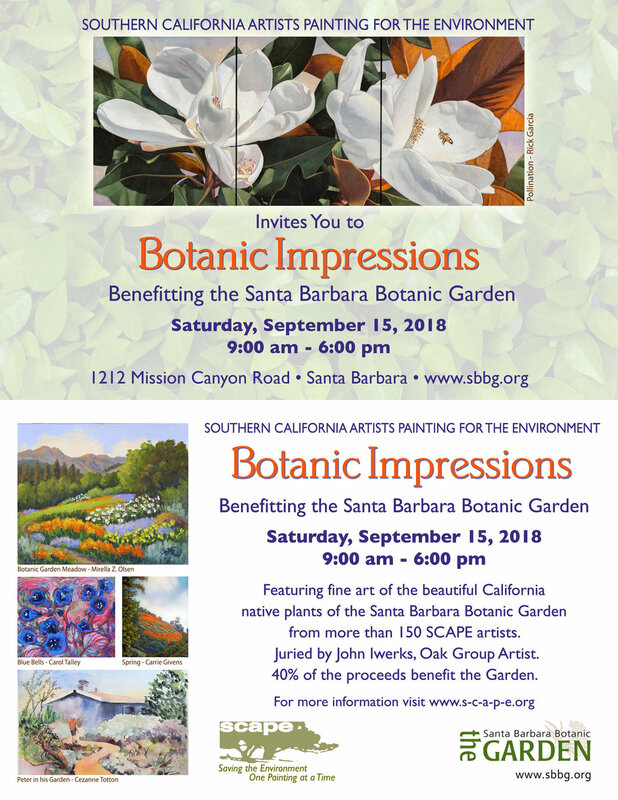 Many thanks to all the artists who are contributing their talents to benefit the wonderful conservation work that the Santa Barbara Botanic Garden is famously known for. Art show to benefit charities of the artists' choice. Sales and charitable donations to be handled by individual artists. Maximum painting size 9" x 12”, not including frame. Entry fee $10 for up to two paintings. Entries must be family friendly (i.e., no nudes) but no set theme. We are encouraging new artists to bring in their small images to this friendly setting. All sales will be handled by the artist, and each artist can donate to beneficiary of their choice. in the afternoon, details to be released later. EXHIBIT NEWS: Read more about our shows! 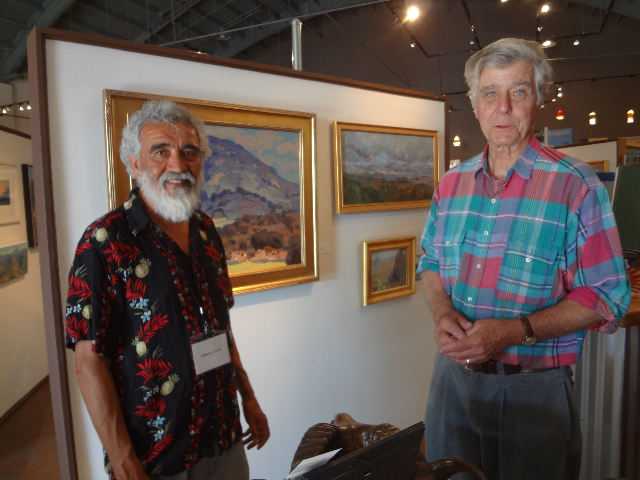 The exhibit, highlighting and benefiting the UCSB Nature Reserves, held at the Montecito Country Club on October 24 & 25, 2015, was a great success. Paintings entered totaled 182 and 170 were accepted. Thirty-three paintings were sold. The juror was Susan Savage. The ingathering for the County Parks Exhibition went very well. There were 104 entries and 71 were accepted by Juror, David Gallup, for the show. It looks fabulous! Thanks to the many members who helped. Receptions were held during 1st Thursday Artwalks in November and December. There is no 1st Thursday in January. February 1st Thursday will be the final one in Santa Barbara before the exhibition travels to Santa Maria where it will hang in the Betteravia Galleries until May 21, 2015. NEW DAY: Pick-up Art: 3:00 - 6:00 pm on May 19 at Channing Peake. The adventure that began with a proposal 10 months ago has ended with a wonderful Exhibit of inspirational paintings, amazing partnerships, and goodwill among all community members to mutually benefit the preservation of our natural surroundings. Thanks to S.C.A.P.E. Board members for their support, to Jane Hurd and Filiberto Lomeli for preparing and mounting the exhibit at the hip Santa Barbara Art Foundry & Gallery, to our Juror, conservation artist Patti Jacquemain, to our beneficiary the Los Padres Chapter of Sierra Club for their tireless efforts in Outdoor Education, enjoyment, and environmental advocacy, side-by-side with our District Foresters and the Los Padres Forest Association, all who need our support to keep our front and back countries available to the public. A gift to Nature. “It takes a village,” and thank goodness we had a village! Thank you to all the many, many, dedicated volunteers that helped with the show. Special thanks go out to Filiberto Lomeli, Natalie Wilson, Cyndi Burt, Meg Ricks, Bill & Nancy Hull, Carrie Givens, Susan Guy, Ruston Slager, Leigh Sparks and of course, Bonnie Freeman who shouldered the load. Congratulations to the award winners: Beneficiary’s Award, Ivanie Finsvik; Juror’s Award, Jane Hurd; 1st Place Acrylic, Daniel Linz; 1st Pastel, Carrie Givens, 1st Watercolor, Larry Iwerks; 1st Oil, Jane Hurd. Honorable Mentions:Anne Anderson, Filiberto Lomeli, Meg Ricks,William Hull, John Rinlaub, Robert Rowley, Nicole Strasburg, Blair Harper, Nancy Freeman and Kate Eden. It was a spectacular exhibition and reception. — Jane Hurd, Exhibits Co-Chair, S.C.A.P.E.